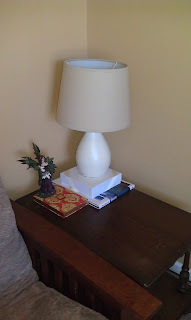 JMC Creations: Repaint a Goodwill end table! Repaint a Goodwill end table! I have a new project to show all of you. It took a while to get this one started. I had the table for about a year or maybe more before I even touched it. You can see the table here. 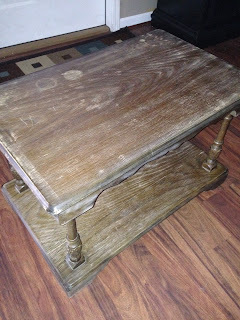 I originally bought this table from a Goodwill and was going to use it to make a small bench. It is actually pretty short for a regular end table. I put it in this place to keep it out of the way until I got ready to make the bench. But I then noticed that with our futon right here in this room it was the perfect height! That is when I decided to go ahead and use it as an end table. So first I sanded it down to get the little bit of clear coat that was on it. I primed the the table then painted it with some paint I had left over from painting the desk in the same room. Then I picked up a stencil at Hobby Lobby and ended up with this! The last step was to seal it with Polycrylic! It is the same stuff I used on another project and it is holding up great! I love the way it turned out! So much lighter and brighter. Hope you have a wonderful Holiday and I hope I get another project up here soon!